As the saying goes, necessity is the mother of invention. This panzanella was made in an effort to use up some veggies in danger of being forgotten in the depths of my frigidaire. As the saying goes, necessity is the mother of invention. This panzanella was made in an effort to use up some veggies in danger of being forgotten in the depths of my frigidaire. 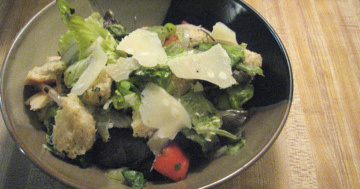 Panzanella, aka bread salad, is a great way to make a quick but delicious dinner while clearing out the fridge. The players: a big hunk of bread going stale; a couple lovely tomatoes; a corner of a tub of homemade basil pesto not large enough to cover a serving of pasta; and some celery that was not going bad, but was persistently in my crisper, taunting me that I would never be able to use it all up. I didn’t really follow a recipe, but my method is laid out below, and I’ve included rough proportions below which you can tweak to your likings and unique frigidaire situation. 1. Cube the bread in fairly large chunks and toast in toaster oven, regular oven, or skillet, until lightly browned and crispy. 2. Slice half of a red onion into thin half-moons, place in a large bowl with a couple tablespoons of red wine vinegar. This is to soften the raw onion taste. 3. Cube the tomatoes and add to the bowl with the onions, along with any tomato juice from your cutting board. Sprinkle with kosher salt, and toss with the onions. Salt draws out the natural juices of the tomatoes. 4. Thinly slice one stalk of celery, and tear up the lettuce leaves into bite size pieces. Add to the large bowl, along with the toasted bread cubes. 5. Toss all together. The red wine vinegar used to mellow the onions, and the juice from the salted tomatoes should provide a good amount of moisture to dress the salad, but my mixture seemed a bit dry at this point, and besides I wanted to use up my pesto, so I poured a bit of oil into the tub containing the last bit of my homemade pesto, shook the container vigorously, drizzled the resulting basil-y oil over the salad, and tossed again. You could also splash in some of your favorite vinaigrette or just add a bit of oil. 5. 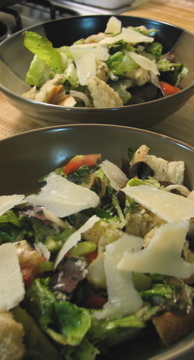 Divide the salad into serving bowls and top with shaved or grated parmesan cheese.